Despite falling sales and profits, Potash Corporation of Saskatchewan Inc. (TSX:POT)(NYSE:POT) edged almost 14% higher during the last quarter of 2016, ending the year in the green. Investors bet on hopes of a turnaround in Potash Corp.’s fortunes as fertilizer prices appeared to stabilize, even as the fertilizer giant announced plans to merge with Agrium Inc (TSX:AGU)(NYSE:AGU). Unfortunately, investors’ hopes could be dashed as key potash-importing nation India just hinted at something that could, once again, send demand and prices of potash tumbling. 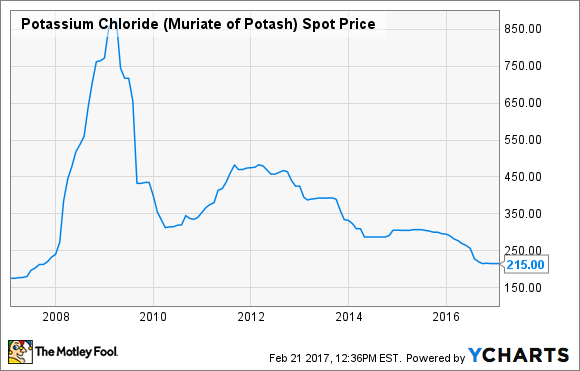 Potash prices are still hovering at multi-year lows and are almost 75% off from their peak of 2009. Deteriorating demand from the top two consuming nations, China and India, are largely to blame for this drop in potash prices. India is a major market as it imports nearly its entire potash requirement from manufacturers in the U.S. and elsewhere. Potash Corp., Mosaic Co (NYSE:MOS), and Agrium export the nutrient through Canpotex — a marketing association formed by the three companies. All three companies have scaled back production in recent years to deal with the supply glut, but it hasn’t really worked as producers from other regions continued to add to the global supply. Meanwhile, tumbling prices put the ball in China’s court, allowing it to negotiate drastically low prices for its potash purchase contracts. Last year, China signed one of its first yearly contracts with Belaruskali’s export arm, BPC, at prices almost 30% lower than 2015. China’s prices usually act as a benchmark for other export contracts. China is just one part of the equation though, and much of the blame for low potash demand in recent years can be passed on to India. Last year was in fact among the most challenging years as the Indian government cut subsidies on potash, even as the rupee weakened considerably, making potash imports expensive for the farming community. It looks like India has similar plans for 2017-2018. Why 2017 could be another tough year for Potash Corp. The Indian government is reportedly planning to slash subsidies on potash by another 17% this year, which could hit demand for the nutrient hard as lower subsidies mean higher costs for farmers. That could deal a double blow to potash exporters such as Potash Corp., Mosaic, and Agrium. First, a lower subsidy could deter farmers in India away from potash, thus hurting imports. Second, Indian firms will likely negotiate for lower prices on whatever contracts they sign this year to make up for the loss in subsidies. That’s the last thing Potash Corp. wants to see at a time when it’s betting primarily on stabilizing potash prices that are backed by improving demand from international markets to boost its sales. If imports from India decline, Potash Corp. may fall short of its adjusted earnings estimates of US$0.35-0.55 per share for 2017, especially as other nutrient markets — nitrogen in particular — continue to be weak. So, if you’re betting on Potash Corp. now, you may not want to miss any news from India and China, as these two nations still hold the key to the company’s fortunes.